Whenever Thanksgiving rolls around, there are a few things you can usually count on: Families will count their blessings, nobody will count their calories, and Macy's will put on a show. Since 1924 the department store titan has lined the streets of New York with an assortment of attractions in what would become Turkey Day's most famous parade. It started as a slew of zoo animals interspersed with floats and Broadway performers and grew into a star-studded, helium-fueled affair. Whatever form it took, the parade always had something noteworthy to offer. Of course, being noteworthy isn't always a good thing, as Macy's can definitely attest. Its famous November procession has had plenty of stumbles, mishaps, and awkward moments. Some have been glum and others dumb, but all of them are reminders to feel grateful when life goes to plan. Here are some of the noteworthy times the Macy's Thanksgiving Day Parade went wrong. Everything about confetti is wrong. 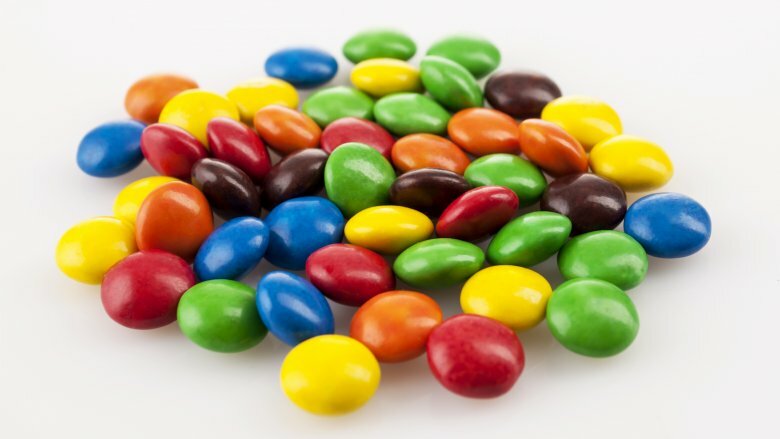 The word is the Italian plural of "sweetmeat," which is just a confusing way to describe candy. The confetti thrown at special events makes even less sense because it's not remotely sweet or meaty — it's just festive garbage. 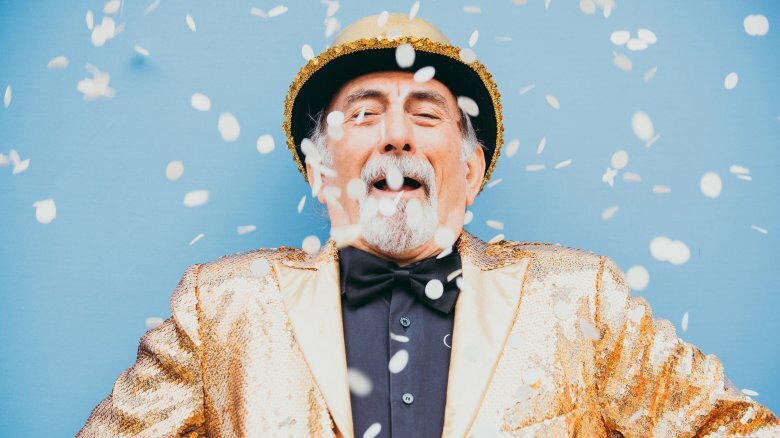 By far the wrongest thing about confetti was that time it gave would-be identity thieves something to be thankful for. The confetti that greeted crowds at the 2012 Macy's Thanksgiving Day Parade didn't just consist of colorful sky trash. Intermingled with the mess were shredded documents from the Nassau County Police Department. Tufts University freshman Ethan Finkelstein noticed that something was amiss and did a little police work of his own. Finkelstein followed the literal paper trail and found people's social security numbers, home addresses, license plate numbers, and part of a police report about a pipe bomb attack. Business Insider reported that some of the paper scraps allegedly revealed the real identities of undercover officers. Other fragments listed details about the motorcade used by former presidential hopeful Mitt Romney for his final debate against President Barack Obama, according to CNN. Macy's pleaded innocence, saying it uses commercially manufactured confetti, not recycled materials. It's still unclear how all that confidential info ended up getting scattered on the streets of New York. In 1974 Broadway unofficially became Sesame Street. That year Jim Henson's lovable Muppets debuted at the Macy's Thanksgiving Day Parade on a float carrying Bert, Ernie, and other favorites. 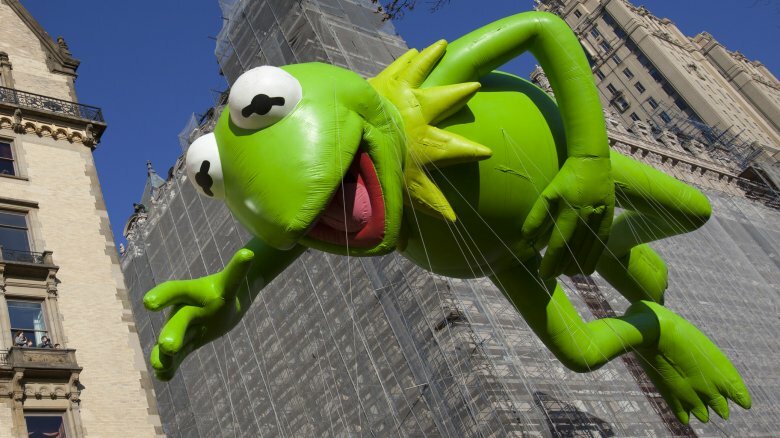 In 1977 Macy's chose Sesame Street's resident reporter, Kermit the frog, to be the first Muppet balloon, giving him a bird's-eye view of parade-related events. But instead of merely reporting on what he saw, he sometimes wound up in the news for not-so-nice reasons. In 1985 Kermit nearly croaked after his abdomen was slashed open in Central Park. Unable to float more than a few inches off the ground, the frog occasionally had to be carried on people's shoulders, according to the New York Times. Six years later Central Park struck again when a group of tree branches deflated Kermit's head. He finished the parade with a sagging head and a long face. Perhaps he hung his head because Miss Piggy wasn't there to comfort him. Either way, Kermit was right: It's not easy being green. Looking back at the history of Macy's parade balloons, it's little surprising that the idea ever got off the ground. Designed by puppeteer Anthony Frederick Sarg, the original inflatables looked like horror movies in the making. They had lifeless smiles, saucer eyes, and wildly disproportionate bodies. But even if we assume these garish nightmares seemed charming at the time, in the early going they were also agents of chaos. 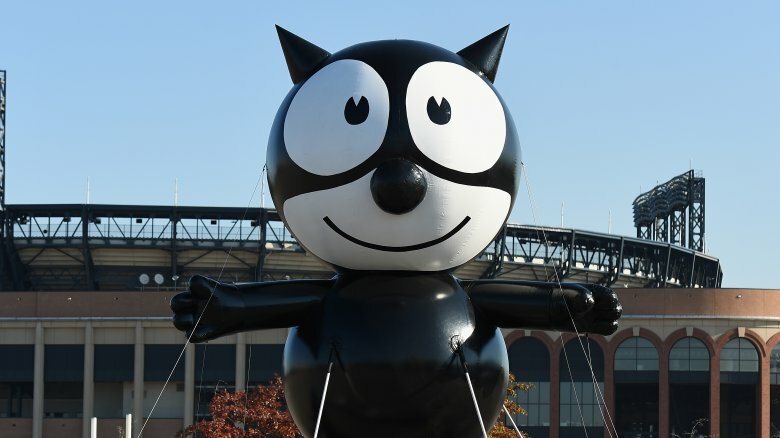 The first of these rubberized horrors was Felix the Cat, who greeted paradegoers in 1927. Unfortunately, he had a rough goodbye because he wasn't designed to deflate, according to Time. Macy's released him into the air, where he eventually popped. The next year balloons were fitted with release valves that allowed helium to escape in a week's time. In the meantime, Macy's continued setting the balloons adrift and offered monetary rewards for returning them. Then the insanity began. People pursued the balloons by land, sea, and even air. In 1928 a group of prize seekers ripped a balloon to pieces in a tug of war, per the New York Times. In a different instance tugboats went after a balloon that had split in two. In 1931 a blue hippo was purportedly spotted over the ocean and Felix the Cat met an even worse fate than he had four years prior. This time, he bumped into a high-tension wire and caught fire. Macy's ended the bounty program in 1932. Usually, when a gigantic animal battles a plane in New York City, it's an oversized ape that just abducted a woman. But in 1932 it was a cat. Not just any cat, but a 60-foot Tom-Cat balloon. As recounted in the book Macy's Thanksgiving Day Parade, Tom-Cat had the "honor of carrying Santa Claus into Herald Square." Back then Macy's ended parades by letting balloons float aimlessly into the sky and asking people to return them for a prize. A biplane attempted to bag Tom-Cat but wound up in a dogfight instead. 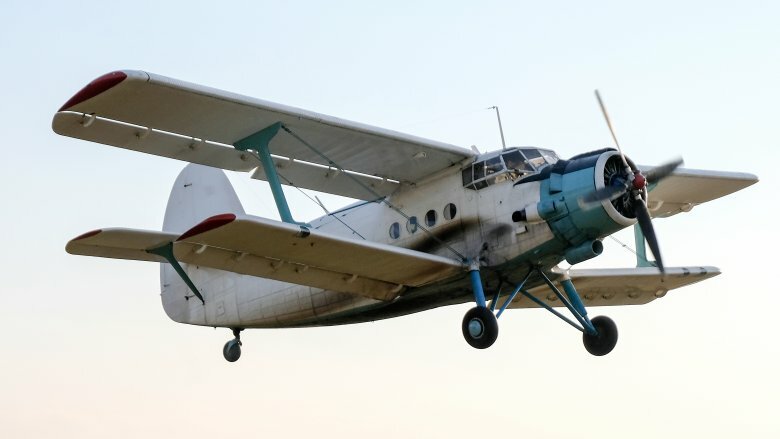 Inside the aircraft were flight instructor Hugh Copeland and his student Annette Gibson, who wittily declared, "I think I'll have a piece of the neck" before making her move. The plan backfired horrendously as Tom-Cat wrapped around the plane's left wing. Gibson and Copeland suddenly found themselves on the wrong side of gravity. Scrambling to halt their descent, Copeland shoved his student aside, causing the cabin door to swing open. Luckily, a safety belt prevented Gibson from landing without the plane. The aircraft "came within 80 feet of the rooftops of Queens" before things finally started looking up. Afterward Gibson continued her streak of awesome one-liners, remarking, "I have something to be thankful for this Thanksgiving." After that close call, Macy's wisely stopped releasing balloons. It's no secret that large amounts of candy are bad for you. In most cases that badness comes in the form of needing to buy larger clothes or having a dentist shove a power tool in your mouth. But some inedible sweets posed an even bigger health hazard during the 2005 Macy's parade. Per the LA Times, a 515-pound M&Ms balloon went haywire in 15 to 20 mph winds, causing one of the ropes to decapitate a lamppost. The detached lamp head landed on two sisters, aged 11 and 26. The younger sibling sustained cuts while the 26-year-old needed stitches for a gash on the back of her head. If you don't remember seeing that on TV, it might be because NBC pulled a switcheroo. According to the Associated Press, the station played a clip from the previous year in which the same enormous M&Ms didn't injure anyone. Announcer Katie Couric informed viewers they were watching a recording, but the underlying reason wasn't addressed. Obviously Macy's didn't foresee the incident, but the company had the benefit of hindsight. In 1997 a similar lamppost collision involving a Cat in the Hat balloon left a woman in a coma, prompting Macy's to strengthen its safety precautions. Yet in 2005 a bunch of balloon handlers received all their training from a six-page pamphlet and weren't checked for physical fitness. During the 1990s an electronics engineer, massage therapist, and musician named David Joyner brought Barney the dinosaur to life and showed kids how exceedingly easy it is to befriend large carnivorous animals. Unfortunately, a blustery day in the Big Apple put him on the endangered species list. The New York Times painted a jarring portrait. In 1997 "sudden bursts of punishing wind spun havoc at Macy's Thanksgiving Day Parade." Animal balloons moved like rabid beasts and had to be put down. A building-sized Cat in the Hat sent a lamppost crashing onto the crowd, nearly killing a woman. The Pink Panther trapped two of its balloon handlers and had to be stabbed by police. The wind blew balloons to bits, and Barney blew himself up. The once huggable dinosaur looked eager to eat his fans as he swayed menacingly toward screaming spectators. "Barney attacked us," one paradegoer commented. After thrashing about wildly, the dinosaur was punctured by a light pole, causing his right side to burst open. Slowly the crowd fell silent as Barney fell to ground, the air escaping his body in one long dying breath. The Macy's Thanksgiving Day Parade is irrefutable proof that Milli Vanilli had way more talent than people gave them credit for. They lip synced other people's songs more convincingly than some musicians lip sync their own biggest hits at the parade. There've been a couple obvious lip slips on Turkey Day, like when the band American Authors forgot to fake-sing and fake-strum their instruments. The most conspicuous one occurred in 2011 when that year's American Idol winner, Scott McCreery, sort of performed his single, "The Trouble with Girls." The trouble with McCreery's performance was that the vocals started playing long before his mouth did, and an estimated 50 million television viewers could easily tell. Thanksgiving wasn't the first time he struck out musically. One month prior he performed the National Anthem at the World Series and seemed to sing, "No Jose" rather than "O say." Say it ain't so, Jose! South Dakota might have Mount Rushmore, but hardly anyone's in a rush to see the rest of the state. It took President Obama seven years to visit, and he saw all the other states first. When he finally arrived, he joked, "I was saving the best for last," which is hilarious because "save the best for last" is a tourism slogan in Fargo, North Dakota. South Dakota has tried to seem more interesting by contrasting itself with an uninhabitable planet. However, in 2013 the state's tourism float at the Macy's parade seemed equally inhospitable. State officials sought out musicians to perform on their float, but as the Associated Press explained, all their preferred artists either couldn't or didn't want to. 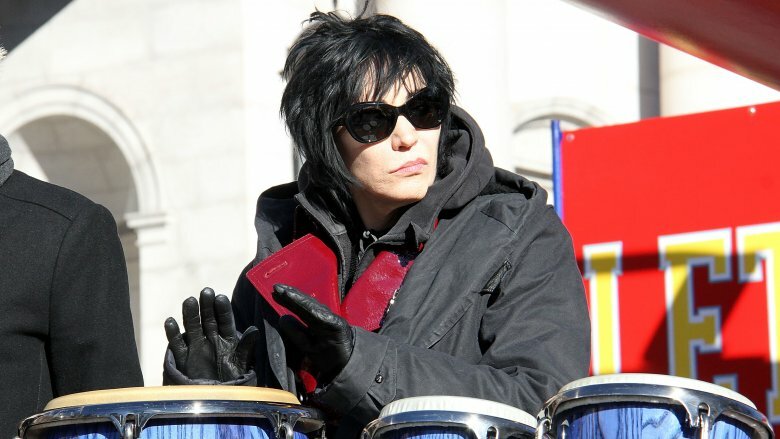 Macy's tried to save the day by enlisting iconic rocker Joan Jett (above), but South Dakota's cattle ranchers said no because Jett loves animals and doesn't eat meat. South Dakota's tourism secretary complained that residents thought state officials let a vegetarian and animal rights activist represent their state. Macy's didn't want to deal with all that bull, so Jett went on a different float and was replaced … with a band whose members included "outspoken vegetarians." According to ABC, PETA spent weeks opposing SeaWorld's involvement in the parade. The New York Times reported that the animal rights group orchestrated a protest effort in which more than 78,000 people supposedly emailed Macy's to complain. Their cries fell on deaf ears, but when the float had its big moment, no one could take their eyes off 12-year-old Rose McCoy, who hopped a barricade and delayed the parade. McCoy's 15 minutes of fame lasted 30 seconds, per the New York Daily News, but she felt like she won. "One of the cops said I ruined the parade, which actually made my day," she bragged. Macy's tried to rain on her parade and claimed they didn't even notice McCoy "among the three million spectators." PETA, on the other hand, was thrilled with her pint-sized protest and pulled a similar stunt in 2014. If we could pick a character from the Popeye universe to be turned into a giant parade balloon, we'd choose Bluto because he's blimp-shaped. However, in 1957 organizers went with everyone's favorite sailor man, Popeye, whose forearms are blimp-shaped. You might think that was the better choice since Popeye is the protagonist, but he's a bad role model. He always beats Bluto by eating spinach that's clearly laced with performance-enhancing drugs, and he smokes like a chimney. 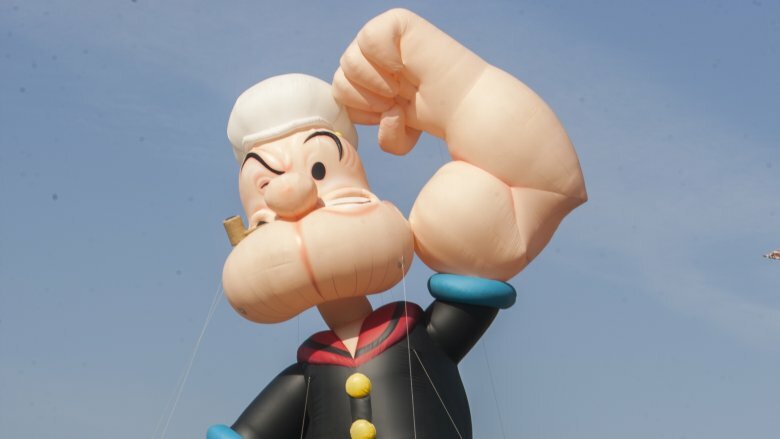 In fact, Popeye the 56-foot-tall balloon had 80 pounds of fake tobacco in his pipe. Plus, 1957 wasn't a good year for his Thanksgiving parade debut. It was a rainy day in New York City, and Popeye didn't have an umbrella. Not only did that render his pipe pointless, but it caused his hat to fill with water. Evidently, they didn't make a can of his spinach-roids because he wasn't strong enough to finish the parade without his head tilting and pouring cold water all over paradegoers.